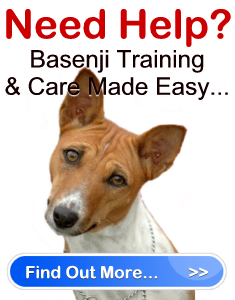 Basenji Training Made Easy " "
Basenji traning when started out young can be done easily. Young basenjis are responsive and have a desire to please their owners. However, if a basenji grows old untrained and unsocialized, this dog breed will take the role of the pack leader and act in its own terms. Moreover, being an intelligent and independent dog, the basenji training is best done without violence. A basenji training focused on reminding the dog who is the “alpha”, the pack leader will work best for this dog breed. These dogs are the type who would take being humiliated seriously. However, here are three steps for an effective basenji training. Basenjis are jokingly nicknamed as “A.D.D dogs” because of their short attention span. These dogs can be distracted very easily since they are very curious and would not think twice about turning their heads if there are squirrels, cats, or other things around that they might find interesting. A distracted dog means that the owner can have a chance of getting the dog’s attention. Remember that the basenji is a hunting dog and it works best with hunters when given proper training. Once the basenji is given a command, they would immediately recognize who is on the “alpha” mode. When the dog obeys, they take the “submissive role” and accepts the owner as the “alpha”. Give a basenji a command like “Sit!” or “Stay!” which will get them back in their “obedience” mode. This particular dog breed is also filled with energy and is very unlikely to get weary immediately. When the dog obeys, this is an opportunity for the owner to give praise and reward. The basenji training uses the basics of clicker training, where an action that is positively rewarded will have more impact on the basenji. Giving praises and rewards to the dog will give them good feelings and will be a form of encouragement for the basenji. If the dog displays good behavior, strongly reinforce it and just ignore bad behavior. Negative consequences like leash jerkikng, hitting, or shouting at the dog will only encourage the basenji to repeat the negative act. However, being ignored is something that would really get into dogs. So when their actions are not given any attention, the chance of the basenji repeating it is very unlikely. Basenjis are intelligent dogs who will only take orders from the “alpha” or the “pack leader.” Their owners must have an authoritative nature who knows what they want and what they want their dogs to do. Additional basenji training that must be done are socialization of the dog breed among other humans, dogs, and animals. When confronted by strangers, the basenji might not be comfortable. When left alone with other animals, the basenji will take the role of the pack leader and this might cause conflict. An elegant and graceful hound dog bred to help hunters, Basenjis like working in discipline but it must be fueled with respect, not fear. As a matter of fact, negative consequences in dog training, whatever breed it might be, is never recommended. This will only create a lose-lose situation between the owner and basenji.